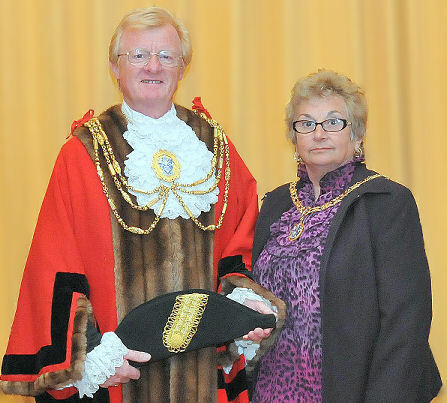 The current Mayor of Brighton & Hove is Councillor Geoff Wells. He was elected by the other councillors at the Annual Council Meeting on 13 May 2010. His term of office is for one year until Annual Council on 19 May 2011. Councillor Geoff Wells was born in Brighton and educated in the city at Queen’s Park School. On leaving school, he undertook a five year apprenticeship in plumbing before deciding to set up and run his own plumbing business. During this time, he married his wife, Sally, and they now have a son, Lee, and two grand-daughters. Councillor Wells was first elected in 1993 for Woodingdean Ward as a councillor for East Sussex County Council, he is currently Member for Woodingdean Ward for Brighton & Hove City Council. The Mayor is the first citizen of Brighton & Hove and represents the council at public affairs, civic and ceremonial events both in and outside the city. The Mayor has a social and ambassadorial role to play and is a figurehead for the community. Geoff has chosen four locally based charities to support during his mayoral year; these are The Alzheimer’s Society; Macmillan Cancer Support; The Martlets Hospice, and the Sussex Heart Trust.